A birthday is a special occasion that most children look forward to with excited anticipation. Unfortunately, because of their family situation, some of the children who come to The Settlement Home have had few birthday celebrations. It is important to us to celebrate each child on their special day. That sentiment is shared by Happy Birthdays, a nonprofit that is making sure every child in foster care in Central Texas experiences support and love for their birthday. Their mission is to provide a “birthday in a box” to each child for their birthday. We talked with Suzanne Gladden, the Executive Director of Happy Birthdays, about her new and growing organization. 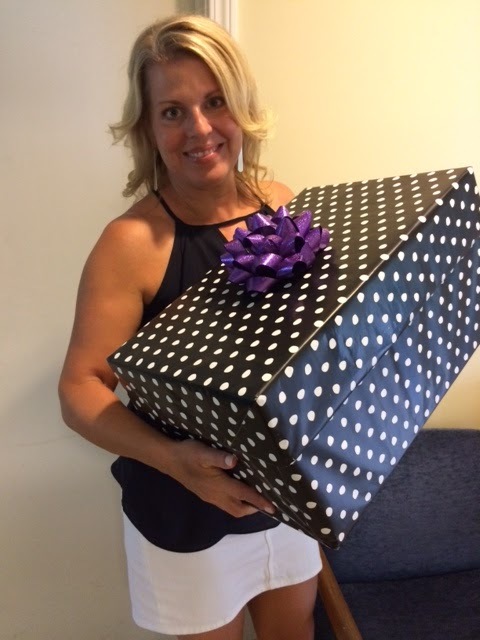 Suzanne delivers a box to The Home. Showing the contents of the box to our staff. A lot of time and care goes in to selecting the right contents for each box. 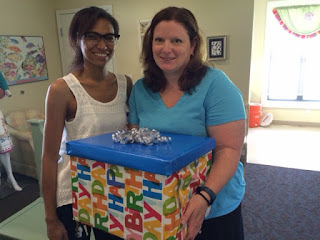 TSH: You provide Birthdays in a Box for foster and homeless children. Where did you come up with this idea? SG: The idea came basically out of a desire for my children to learn about giving back. I tend to go nuts for their birthday parties, as do so many of their/my friends! 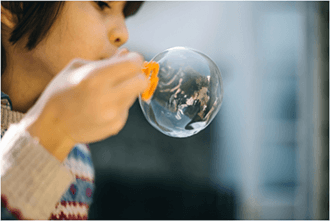 One day when I was shopping for birthday gifts for several upcoming kids birthdays, I started thinking that there must be many, many children who aren’t as blessed as mine…who may have never even experienced that joy of a simple birthday party, much less the ones our children were accustomed to. I called the Texas Baptist Children’s Home that day from the Target parking lot. I asked the woman on the phone how the children who lived there celebrated their birthdays. She told me it wasn’t the same for all of them. Sometimes they had a sponsor to donate a cake and a gift, but other times children might not receive as much. I told her that I wanted to commit to a birthday party for every child living there for one year. When she replied there were a hundred children, I knew I had to get my friends involved! Within one month, mostly through posting on Facebook, we had over a hundred families wanting to make a birthday party boxes. That’s when I knew we could do more….way more! TSH: What are some of the organizations that receive the boxes? A volunteer drops off a box. Each box is festively decorated. TSH: What things do you put in each box? TSH: Someone reading this might want to join your group. What’s the best way to get involved? SG: Our website ( http://sharinghappybirthdays.org/ ) has all the directions on how to make a box with pictures and lists of items to be included. There is also a calendar where volunteers can pick a specific child to make a birthday party for. Volunteers are also welcome to make any type of box they want and we will get it to an appropriate child. TSH: There are many pictures on your FaceBook page that show children who have helped assemble birthday boxes. Can you share with us the things these young volunteers are doing and why it’s so important? SG: So many kids get involved by making boxes. We have had Girl Scout troops, dance teams, Cub scouts, and entire elementary schools get involved. It is a wonderful activity for children. If you have kids you know, their birthdays are very important to them! Kids especially can identify with a child not receiving a birthday party. Its a great way for them to help another child in a way they can understand. TSH: What do you see for the future of Happy Birthdays? SG: In the seven months we have been doing this we have delivered over 300 birthday parties to children in the Austin area. We also applied for 501(c)3 status and started planning our first Happy Birthdays fundraising event. The event will be a giant, family friendly birthday party celebrating our first year on October 25th at the Rabb House in Round Rock. Our mission is to provide every child in Austin in need with a birthday party. Beyond that I would like to see Happy Birthdays become a model that can be placed in any area across the United States. Because…everyone deserves a birthday party, right? For more information on Happy Birthdays, click here. We are so thankful for the support we have received from Happy Birthdays! Thank you for helping make this special day memorable for our children!